Walk the beat with confidence wearing the M83 Nylahide® Duty Double Magazine Pouch from DeSantis. Designed to handle the extreme conditions of daily tactical use, the holster is constructed from a uniquely-fabricated, synthetic Nylahide® material. The holster's strength comes from its infused polymer core that delivers an extremely durable shell, with superior rigidity, shape retention with virtually no added weight. Each magazine fits snugly into the vertical pouch sleeves and is secured by a heavy-duty snap strap. 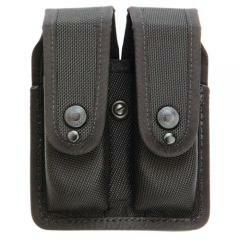 The strap is adjustable to accommodate magazines of various sizes and capacities. The sewn-on rear built loop securely attaches to any duty belt up to 2.25-inches wide and offers both vertical and horizontal carry options.